It could use a price cut, a better fit, and a sleeker look, but the sound quality is phenomenal for gaming purposes. Conventional wisdom goes like this: “Skip the gaming headset and buy a great pair of headphones and a standalone microphone for the same money.” And why not? Most of the headsets we review come from jack-of-all-trades companies like Logitech, Razer, and Corsair, attempting to compete with dedicated audio companies. The deck is stacked against them from the start. But every once in a while we get a gaming headset from a mainstream audio company, presenting an interesting deviation from the norm. In these cases, the reverse usually plays out, with a headset nailing the audio side of the equation but flubbing the rest. So it goes with Sennheiser’s new GSP 600, which won’t win any awards for style or comfort but still manages to impress on some aspects. “Won’t win any awards for style” is a bit of an understatement. It’s been a while since I’ve seen a headset as boxy as the GSP 600. The last one was...well, probably the GSP 350 that Sennheiser sent over a few years back. The GSP 600 has a decidedly retro silhouette—the dreaded “Air Traffic Controller” look that most headsets (thankfully) avoid these days. It’s enormous, squat, and bizarrely top-heavy. With the ears extended it looks better but not that much better. Sure, you’re wearing the GSP 600 in front of your PC, not to a wedding or a modeling shoot or whatever. It doesn’t really matter. But it sort-of matters, right? The GSP 600 simply isn’t much of a looker. It makes a few improvements over the GSP 350, swapping the pale-gray of the previous model for a sleek matte black. That, combined with a more industrial aesthetic, helps mask some of the bulk and make the GSP 600 look a little less dated. I like the angular silver hinges between the headband and earcups, for instance, as well as the metallic red highlights. The branding’s inconspicuous as well, which I always appreciate. Point being: Sennheiser has a solid grasp on design, and has put out great devices like the Game Zero headset using many of the same tenets. Sennheiser’s gaming aesthetic is more aggressive than its mainstream devices, for sure, but not offensively so. Nevertheless, the GSP 600 misses the mark and is a far cry from the elegance I associate with a good pair of headphones or even our favorite gaming headsets these days—Logitech’s G533, HyperX’s Cloud Alpha, SteelSeries’s Arctis 7, and so on. And despite its size, the GSP 600 isn’t as comfortable as I expected either. I figured the size was at least in part due to padding. And the GSP 600’s earcups and headband are indeed generously padded. It doesn’t matter though, as the GSP 600 fits like a vice, and that’s after you adjust the secondary “contact pressure” mechanisms. On the headband you’ll find two sliding bars that theoretically change how tightly the GSP 600 grips your skull. In my experience it didn’t make much difference whether they were all the way loose or not. No matter what I tried, the GSP 600 never really reached that happy medium between “secure” and “tight.” I’ve worn it for upwards of an hour or two at a time, and I’m always slightly relieved when I take it off. I don’t consider my head abnormally large either, and found that I had to extend the GSP 600 to its maximum size for a good fit. Consider that a warning. The cabling is removable and the GSP 600 comes with two options: a shorter cable with a single 3.5mm jack and a longer dual-terminus option. The cables are both a bit weird on the headset end, featuring a bulbous piece of plastic that I suppose is meant to “lock in,” but mostly make it a pain to connect the wire to the headset the first time. Last but not least, there’s a volume knob hiding on the right earcup. That’s it, as far as headset controls are concerned. Mic mute is controlled by flipping the mic up out of the way, which I like—although the GSP 600’s mic makes an annoying click noise when you move it up or down. I could’ve done without that feature. So yeah, not a looker and not particularly amazing to wear. Those are the things that most gaming headsets find it easiest nail, and yet it’s where Sennheiser’s dropped the ball with the GSP 600. Flip that sentiment though. As I said up top: Gaming headsets are often great for marathon play sessions, exceptionally comfortable and lightweight, but struggle with audio fidelity. 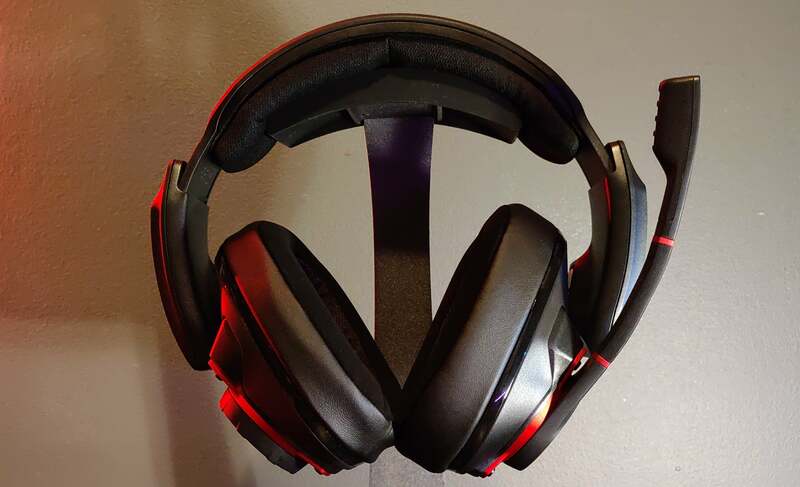 That’s less true than it used to be, as headsets like the HyperX Cloud Alpha manage to bridge both sides to an extent. But even now, HyperX is the exception and not the norm. The GSP 600 sounds pretty damn good, much like a high-end pair of headphones you’d expect to get from Sennheiser. It’s not a flat studio sound by any means. Like both the GSP 350 and the Game Zero, I detect a bit of a mid-range boost that can be fatiguing over the course of the day, especially if you’re listening to a lot of music. Vocals are noticeably bumped, as are some of the treble-heavy instruments (like cymbals). But it’s a vibrant and exciting sound profile, not cloying like some of Corsair’s treble-slanted headsets. Likewise, bass lovers might be disappointed by the GSP 600’s low-end, as it has a tendency to fade into the background. There’s an exceptional precision to it though, with snappy bass drums on the music side and crisp explosions in-game. The real standout though is the GSP 600’s wide soundstage. I applauded Sennheiser for the same accomplishment on the Game Zero, and it’s no less impressive this time around. The GSP 600 is a stereo headset at heart, without any of the fancy software-driven 7.1 surround gimmicks we’ve seen in recent years, but you’d hardly notice the difference. The left-right play in the GSP 600 is some of the most realistic I’ve found in a gaming headset, meaning it’s easy to pinpoint an enemy in-game, while a well-mixed piece of music sees instruments naturally separate into their proper locations. 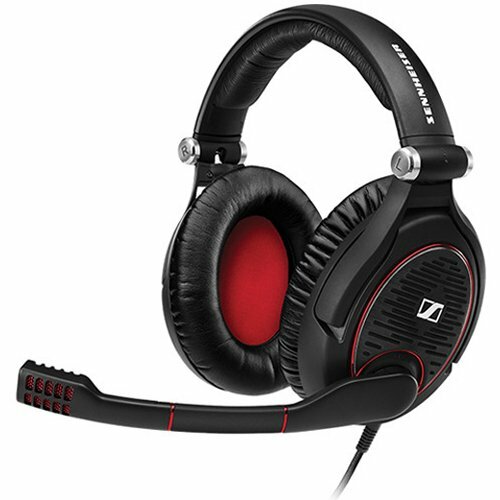 And Sennheiser’s still one of the only companies to really nail the microphone on one of these gaming headsets. Usually the microphone is an afterthough, but the GSP 600’s voice reproduction is crisp, clean, and flattering even without the software tricks most USB-powered headsets lean on. Are you better off buying a pair of headphones and a microphone? 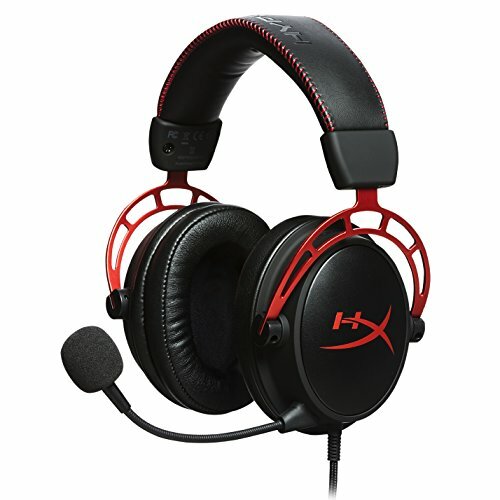 Or just a normal gaming headset, like the HyperX Cloud Alpha? Maybe. Like usual, the biggest hurdle for Sennheiser is the price. Listing at $250, the GSP 600 is far more expensive than even the best wired gaming headsets. It sounds good, but perhaps not $250 good by 2019 standards. The GSP 600 is also a gaming-oriented headset first and foremost, and whether that fits your needs is debatable. That said, I’ve been pretty happy both gaming and listening to music on the GSP 600, enough to put up with the lackluster fit and finish. Personally I think Sennheiser’s Game Zero is a better one-stop solution for music and games, especially now that it lists for $180, but can often be found for much less. The GSP 600 is a solid alternative though—as long as you’ve got a resilient jaw and don’t mind the bulk. This story, "Sennheiser GSP 600 review: An audio-first alternative to your typical gaming headset" was originally published by PCWorld. Sennheiser's GSP 600 could use a price cut, a better fit, and a sleeker look, but the sound quality is phenomenal for gaming purposes and pretty decent for music as well.